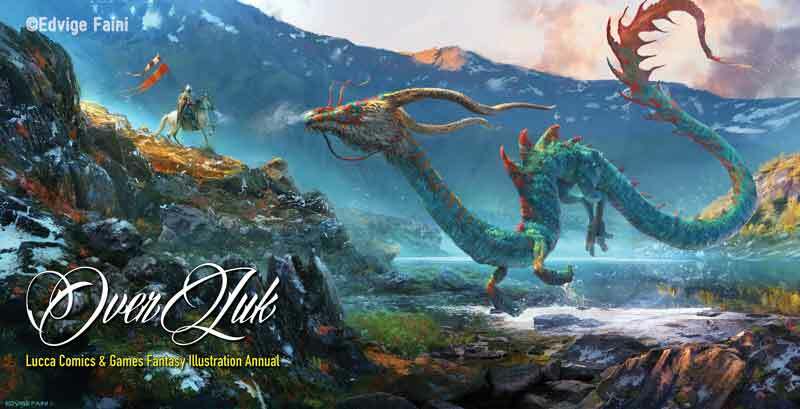 Lucca Comics & Games is proud to present the OverLuk Award, created to showcase and celebrate the work of professional artists in the genre of imaginative realism: fantasy, science fiction and horror illustration, game, videogame, movie concept art. Heralded by Variety Magazine as “the western world’s biggest geek meet”, Lucca Comics & Games festival is today one of the leading convention and transmedial experience for every comics, videogames and fantasy art lover, representing an exciting showcase opportunity for concept artists, fantasy illustrators and creators of imaginative realism working across different media: video and tabletop games, books and comics, cinema and fine arts. The Grand Prize award is an invitation as main guest, including travel, accommodation for 2 persons and a booth at the main european transmedia festival that will be held from 1st to 5th of November in Lucca, Tuscany. Winners for each category (Cover, Interior illustration, Concept art, Editorial, Unpublished/Commission) will have the chance to attend Lucca Comics & Games 2017 and to run their own booth in the Luk for Fantasy area, where the greatest masters of illustration are located. For the 2017 Launch Edition of the OverLuk Award, no participation fee is requested. To represent and honor the ever growing new breed of transmedia artists, the festival has decided to create a new award and linked to the publication of a yearly catalogue of selected entries, the OverLuk Illustration Annual. A great artbook that in 2016 edition included illustrations of Marko Djurdjevic, Tony DiTerlizzi, Luis Royo, Paolo Barbieri, Larry Elmore, Karl Kopinsky, Dany Orizio, Steve Argyle and many more guests of the festival. Aim of the OverLuk Award is to showcase the biggest international fantasy artists and the jury reflects this. The committee itself is composed of world famous artists and creators and of art-directors working for the leading publishers of fantasy and not only. It is really a “parterre de rois”: italian artists like Paolo Barbieri and Jacopo Bruno (founder of The World of Dot), Marko Djurdjevic (artist and founder of SixMoreVodka), Sarah Robinson (Creative Design Director, Paizo), Francesca Leoneschi (Creative Director, The World of Dot), Jeremy Cranford (Art Outsourcing Manager, Blizzard) and Raphael Lacoste (artist and Art Director, Ubisoft’s “Assassin’s Creed”). The Winner will be announced on 30th May on OverLuk Award website.